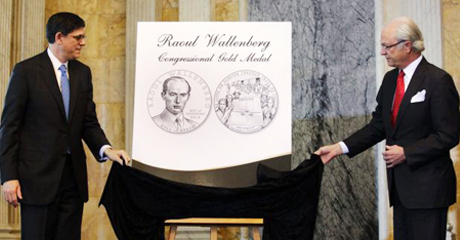 U.S. Treasury Secretary Jacob Lew and King Carl XVI Gustaf of Sweden unveiled the design for the Raoul Wallenberg Congressional Gold Medal during a ceremony held May 9 in the Treasury’s historic Cash Room. The medal was authorized by Congress in recognition of Wallenberg’s achievements and heroic actions during the Holocaust in World War II. After being minted it will be presented in a future ceremony on Capitol Hill, the Treasury Department said in a May 9 press release. Wallenberg was born on August 4, 1912, in Sweden. After graduation from the University of Michigan, he returned to Sweden where he began a career as a businessman and later as a Swedish diplomat. While working at the Holland Bank, Wallenberg began to meet young Jews who had been forced to flee from Nazi persecution in Germany. Working with the War Refugee Board, Wallenberg helped save more than 100,000 Hungarian Jews during the Holocaust, many of whom later immigrated to the United States. Today, hundreds of thousands of American Jews can directly or indirectly attribute their lives to Wallenberg’s actions. The Raoul Wallenberg Congressional Gold Medal will feature a portrait of Wallenberg on one side and a view from his perspective on the other. Wallenberg’s ultimate fate remains a mystery — he disappeared as the war was ending. In 1981, President Ronald Reagan made Wallenberg an honorary U.S. citizen, an honor that had previously only been extended to Winston Churchill. The reverse side will depict Wallenberg’s view as he extends a protective passport (“Schutz-pass”), which identified the bearer as a Swedish subject awaiting repatriation and prevented deportation. In the background are those he could not reach being boarded on a train to be deported to a concentration camp. Bronze reproductions of the medal will be available for purchase from the United States Mint.